The Law Offices of Gregory Krasovsky provide legal representation to plaintiffs who have been injured in aviation accidents. If you are in need of an aviation accident lawyer, contact us today to schedule a free consultation. An aviation accident lawsuit is often difficult to conduct, but our personal injury lawyers have a very successful track record in taking on even the toughest assignments, and work tenaciously to secure each victim an aviation accident settlement. Although airplane accidents are rather rare, they do happen, and when they do serious injury and death is often the result. 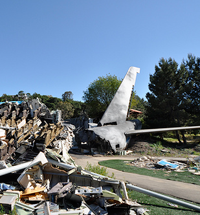 Most people generally assume airplane accidents refer primarily to high profile airliner crashes; however, smaller planes, carrying fewer people, are often prone to accidents as well. Small propeller planes and private jets often have accidents that are not reported on widely by the media. Fortunately, not all of these accidents cause death, but in almost every case the accident is traumatic and causes some form of injury. Furthermore, accidents can take place on airliners that do not result from crashes, but rather from poorly secured luggage compartments, defective walkways, and the like. If you believe you or your loved one was injured as a result of any kind of aviation accident, the Law Offices of Gregory Krasovsky can provide you with legal counsel and representation. Contact our attorneys now for a free consultation.